Western Innovation (WINN) Initiative: $800k for XCO Tech Inc.
HomeBlogGovernment FundingWestern Innovation (WINN) Initiative: $800k for XCO Tech Inc.
XCO Tech Inc. is a technology company in Penticton, British Columbia, focused on improving athletic performance, injury assessment, chronic disease management, and concussion recovery using digital biomarkers. The organization has recently received research and development funding to launch their new sport performance training system and precision medicine products. XCO Tech Inc. has been awarded $800,000 from the Western Innovation (WINN) Initiative. The Western Innovation (WINN) Initiative was a government funding program that supported companies in Western Canada with repayable funding to accelerate technology-based product development and help those products reach market readiness faster. As of November 2017, WINN has been closed and is not expected to reopen. Businesses in Western Canada are now encouraged to look into the Western Business Scale-up and Productivity (BSP) Program. Similar to WINN, the BSP program supports organizations in their efforts to scale-up, commercialize products/ services, improve productivity, and develop and reach both domestic and global markets. XCO Tech Inc. is creating next generation products for sport performance training and concussion assessment. They are using exclusive technology that combines motion tracking data with insightful digital biomarkers to better guide rehabilitation, training, and treatment. The company has received $800k in funding via the Western Innovation (WINN) Initiative for innovative solutions to improve athletic performance. The company is commercializing its proprietary XPSTM and BioAnalyticsTM technology platform to deliver an innovative sport performance training system and a comprehensive concussion assessment product. These products merge motion tracking outcome measures together with biometric and cognitive digital biomarkers to better measure human performance and health. Research and development funding will accelerate the testing and manufacturing of these products with the goal of enabling commercial market introduction in 2019. The Western Innovation (WINN) Initiative was a government funding program designed to help innovative SMEs in Western Canada move their technologies from the later stages of research and development to the marketplace. Examples of projects eligible for WINN research and development funding included technology development and acceleration, validation of market potential and end-user acceptance product certifications, and pilot and technology demonstration projects. While this program is no longer accepting applications, businesses in Western Canada have other options available to help move their technologies to market, such as the Western Business Scale-up and Productivity program. The Western Business Scale-up and Productivity program helps businesses with high growth potential to adopt/adapt innovative technologies that grow operations, support productivity, and increase exports to global markets. The Western BSP program provides a repayable contribution (no-interest loan) of up to 50% of eligible project expenses to a maximum $5 million per project and $10 million per applicant. Eligible companies must uphold profitable operations in Western Canada (Alberta, British Columbia, Manitoba, or Saskatchewan) and eligible projects must focus on advanced manufacturing, digital technology, value-added agriculture, clean technology, life sciences, or clean resources. The Western Business Scale-up and Productivity program accepts applications during defined period intakes. The program is currently open and the next deadline to submit is January 25, 2019. 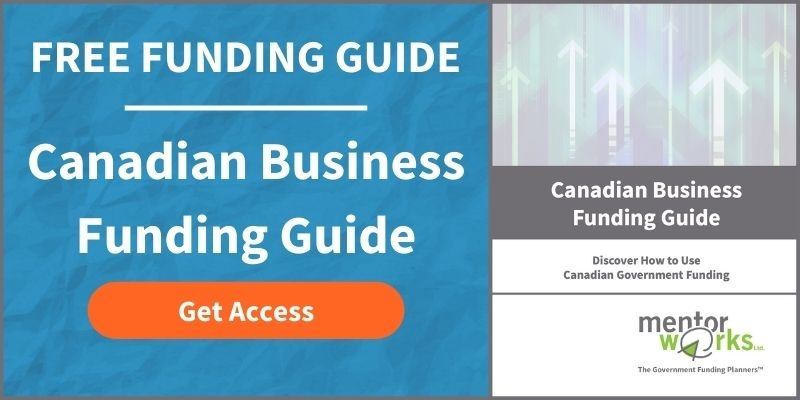 Businesses interested in learning more about government funding programs supporting innovation are encouraged to download Mentor Works’ Canadian Business Funding Guide.